Following our Awards and Final Standings, the Umpire Ejection Fantasy League announces its 2018 UEFL Rules Summit, our annual forum for discussion of controversial issues which may have surfaced during the past season, setting forth a framework for rectifying these issues by amending the existing UEFL Rules Book ahead of the 2019 UEFL season. Related Link: UEFL Rules Book (UEFL Portal). This discussion thread is an open colloquium for proposal, discussion and debate of potential rules changes. This thread will remain open through Friday, November 16 and voting will begin Saturday, November 17—voting will not occur prior to that date. This will provide ample time for proposal and subsequent discussion of possible rules changes for next year's UEFL. If necessitated by certain below decisions, a Summit runoff ballot may be presented after the initial voting closes. You may propose a rules change by replying in a comment to this post and the following list, accordingly, will be routinely updated to reflect such proposals. Nonmaterial proposed modifications and cascading editorial changes are underlined, deletions are printed in strikethrough and material additions are bold faced. Comments/rationale not part of the actual book are indicated by italics. Individual propositions are preceded by the ">>" bullet point symbol. Rule 1 (Selection of Umpires). >> 1-2. ...each member of the league shall select one two MLB crew chiefs to serve as UEFL crew chiefs. Rationale: Adds a second crew chief to list of drafted umpires (+ 2 cc). >> 1-6. Subsequent to the Secondary Draft, each league member shall select one umpire chosen only from the list of umpires classified as "AAA" or fill-in. Rationale: Adds a call-up umpire to the list of drafted umpires (+ 1 AAA). >> 3-3. Unless otherwise specified by Rule 4, each non-incorrect ejection committed effected by a UEFL crew chief's crew shall result in the addition of one (1) point, and each incorrect ejection shall result in the subtraction of one (-1) point, toward a UEFL member's overall score. Rationale: Penalize crew chiefs whose crew's ejections are associated with QOCN. >> 4-8. Ball/Strike Accuracy Reward. An umpire shall be awarded one bonus point for scoring a 98% or greater plate score on any given night. Rationale: We already award points for replay reviews even if they don’t result in ejections so also have a reward for umpires who have a stellar plate job even if no ejections take place. >> 4-9. Ejections shall be attributed or penalized with additional points subject to the reason for ejection (structure to be determined by run-off ballot). Rule 6 (Challenges and Appeals). >> 6-2-b-5. The Quality of Correctness for all ejections for reasons of Fighting, Throwing At, Unsportsmanlike Conduct-NEC or Excess Contact shall be adjudged as "Irrecusable" by default...Ejections for throwing equipment and Throwing At shall be judged individually with no such default status, and may receive a QOCY/QOCN determination. Rationale: Apply QOC standard specifically for Throwing At ejections to determine whether the underlying call (Pitcher intentionally threw at batter) was correct or incorrect, as opposed to irrecusable. A vote in the affirmative will trigger a run-off ballot to determine how to adjudicate QOC (Original Ruling vs Appeals Board, etc.). Rationale: Eliminates QOCU (Irrecusable) as an ejection quality position and requires all ejections be adjudged as CORRECT or INCORRECT. >> 6-3. In the event that Statcast and/or Pitch f/x shows the location as both off the plate (px > |0.831|) AND above / below the strike zone (pz < sz_bottom - 0.245 or pz > sz_top + 0.245) than the correct call shall be BALL even if the pitch is within the Margin of Error for both section 1) and 2) above. This may be referred to as the Dale Scott rule. Rationale: UEFL pitch calling works on the assumption that there is a one inch Margin or Error for Statcast / Pitch fx. When a pitch is recorded by this Statcast / Pitch fx as being within the margin of error it is treated as being in the BORDERLINE area and the call on the field is always deemed correct. This change proposes that a pitch that is in the BORDERLINE area but both off the plate and above / below the zone be ruled as a BALL for purposes of determining QOC. From a statistical measurement point of view. There is less then a 50% chance that either measurement (px, pz) is actually within the zone, when combined it means that a pitch recorded in the area will actually have been a ball more then 75% of the time. From a baseball perspective, as Dale Scott points out, "no one expects it to be called a strike." >> 6-4-a-1. This board shall be comprised of two three UEFL Commissioners, one Charter Member, and five through seven five seven at-large members. Rationale: The permanent members of the UEFL Appeals Board are: Gil (Commissioner), tmac (Commissioner), Jeremy (Commissioner), and RichMSN (Charter Member). Five at-large members are then selected for a total of nine Appeals Board members. This proposal would expand the Appeals Board to a body of eleven (adds two seats). Rule 7 (Unresolved Classifications and References). Rule 8 (Umpire Odds & Ends and Community Issues). >> 8-1. Comments shall be restricted to members registered with the DISQUS commenting platform. Rationale: Turns off guest comments in hopes of reducing spam, violative content, and/or trolling. Rule 9 (Unaddressed and Authorized Provisions). >> Shall all current (as of 2018) at-large members of the UEFL Appeals Board be granted permanent membership on the UEFL Appeals Board? Rationale: To reduce turnover and garner greater consistency among the board's rulings. The final portion of the Rules Summit ballot will feature 2017 UEFL Appeals Board members seeking re-election for 2018, as afforded by the process delineated by UEFL Rule 6-4-a-4. Click here to view the Board's 21 decisions in 2018. 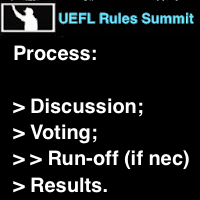 Following the 2018 Rules Summit's discussion phase, voting will occur. No voting shall take place prior to 11/17, until the discussion phase has ended and all proposals become part of the finalized ballot.